I could not be happier about February ending. As you probably know by know, it was a ROUGH month for me, health wise. Whew. I don’t think I’ve ever been happier for the start of a new month! Plus, March means that spring is almost here! I mean, St. Patty’s Day and Easter are right around the corner, and before we know it, the sun will be a bit warmer, and the days will be a touch longer, and all of our winter doldrums will disappear! To celebrate the impending change of seasons (and the start of our weekend! 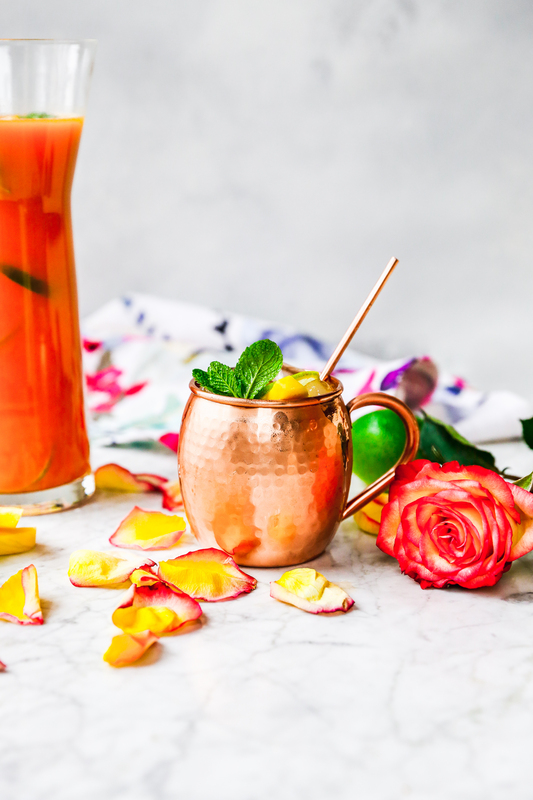 ), I made us a spring-like cocktail today! 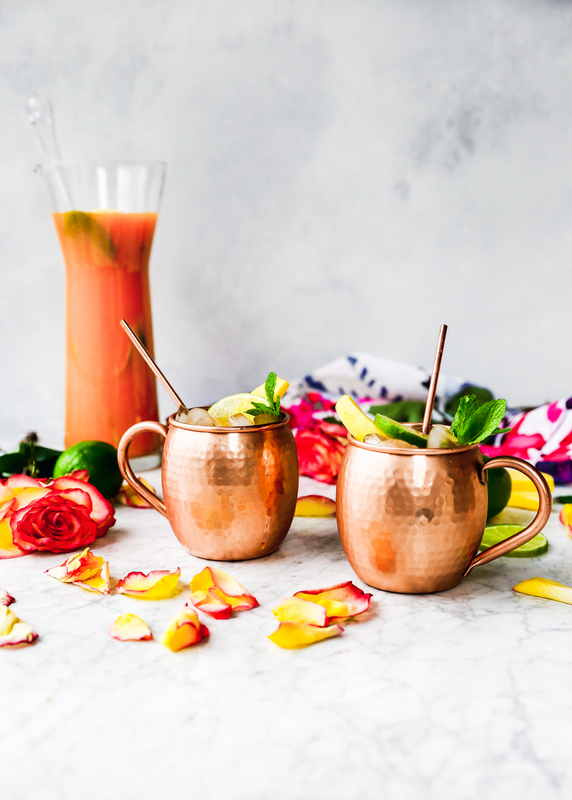 Mango Moscow mules! Yessssss. I mean, just look at that. It’s spring in a freaking glass, people. 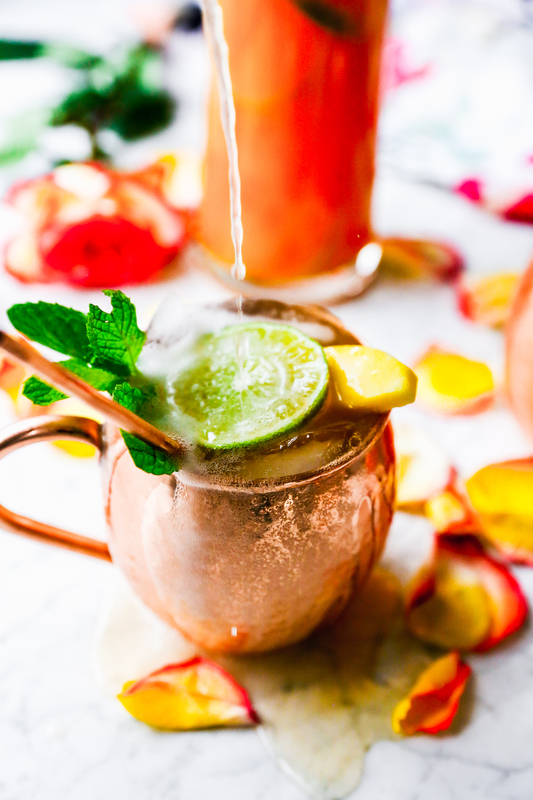 I love a good Moscow mule, which I think stems from my lifelong love of ginger ale. Ginger beer is even better, according to my adult palate. 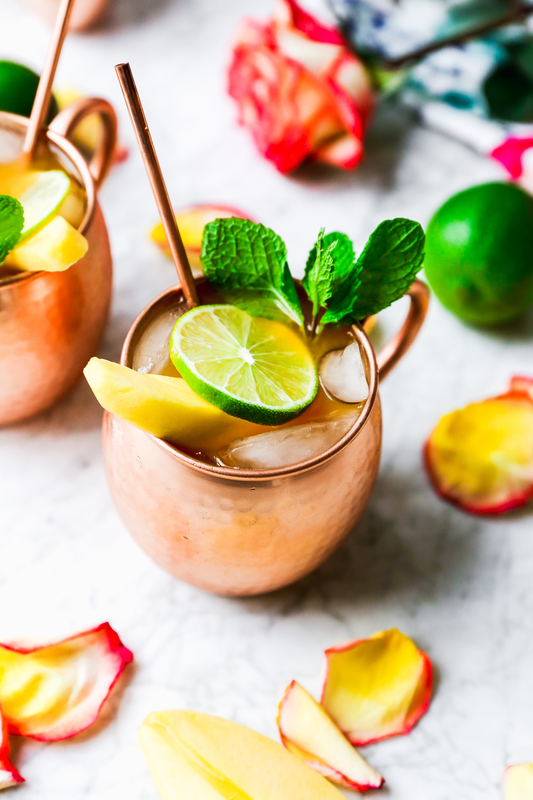 I love when a mule is heavy on the ginger beer but still light and refreshing on flavor. 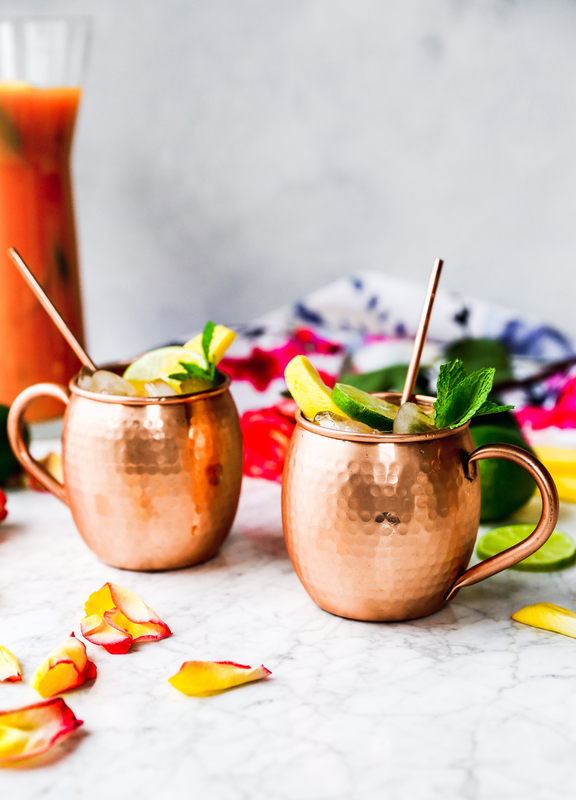 These mango mules fit the bill! It starts with a really easy mango puree. I just used defrosted frozen mango chunks for this, which made these come together in less time with far less prep (I don’t know about you, but peeling a mango might be one of my least favorite produce jobs ever). Whir it up in a blender with a little lime juice and water and you’re good to go! You can use the puree immediately or pop it in an airtight container in the fridge to use later. That’s all the prep this drink requires! I love when cocktails don’t need a simple syrup. Even though simple syrup is pretty, well, SIMPLE…sometimes it’s nice to throw a cocktail together without having to wait for sugar to dissolve in water and then cool. 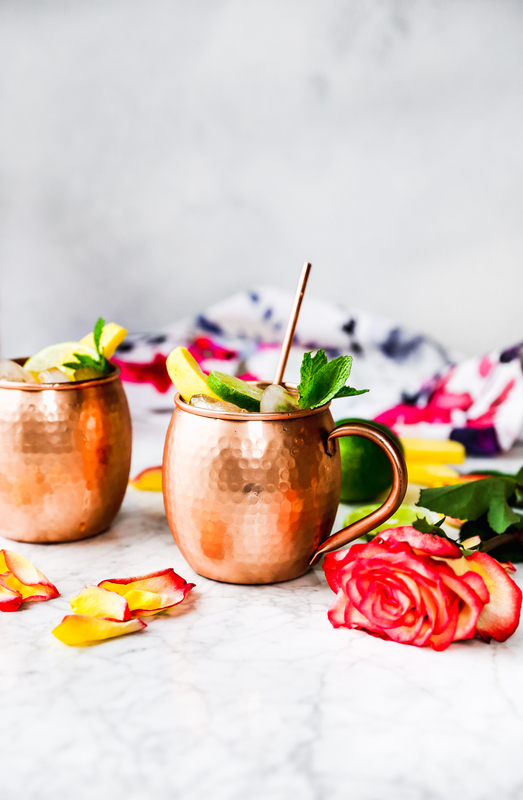 I mean, sometimes you need a cocktail RIGHT THIS SECOND, and these Moscow mules are here for ya. Easy peasy. Plus! I’ve written this recipe so that you can make a larger batch of these! For all your other Friday friends who desperately need a drink after a long week. You mix it all once and enjoy it twice. It’s lovely. It just so happens that I am in need of one of these. Work lately has been stressful. You know that feeling of there’s too much to do and not enough time to do it all? Yeah, that’s where I am professionally right now. And Kieran? My poor little guy needs to go to the doctor today. Sigh. He’s been battling off a nasty chest cold this past week, and I thiiiiiiinnnk he might have an ear infection. Boo. So yeah, I need a drink. And it’s well before noon. Don’t judge me! Cheers to a new (and hopefully healthy!) month! 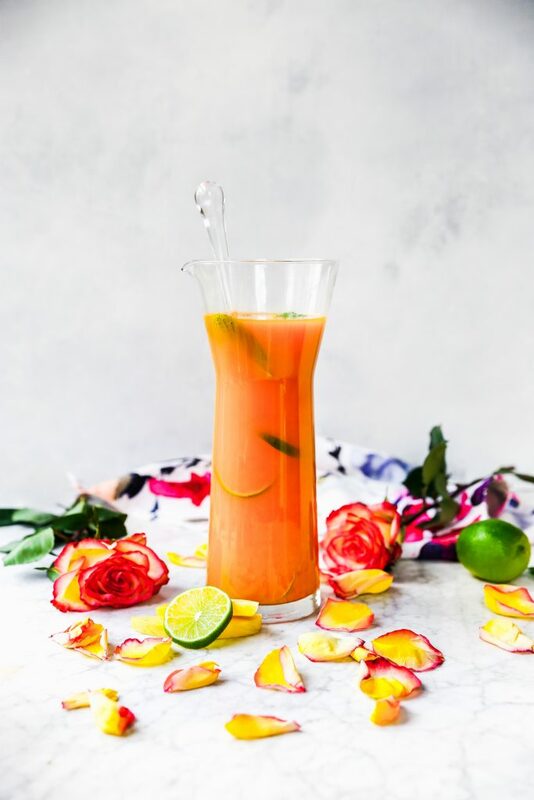 Combine the defrosted mango and lime juice in a blender and puree until completely smooth. If needed, add a splash or two of water to the blender to get the puree really smooth. Transfer to an airtight container and refrigerate until you are ready to use the puree. To a pitcher or serving carafe, add the mango puree, lime juice, vodka, and most of the mint sprigs. Stir to thoroughly combine. Transfer the pitcher to the fridge until the mixture is thoroughly chilled. Fill glasses with ice and add ⅓ cup of the mango mixture to each glass. 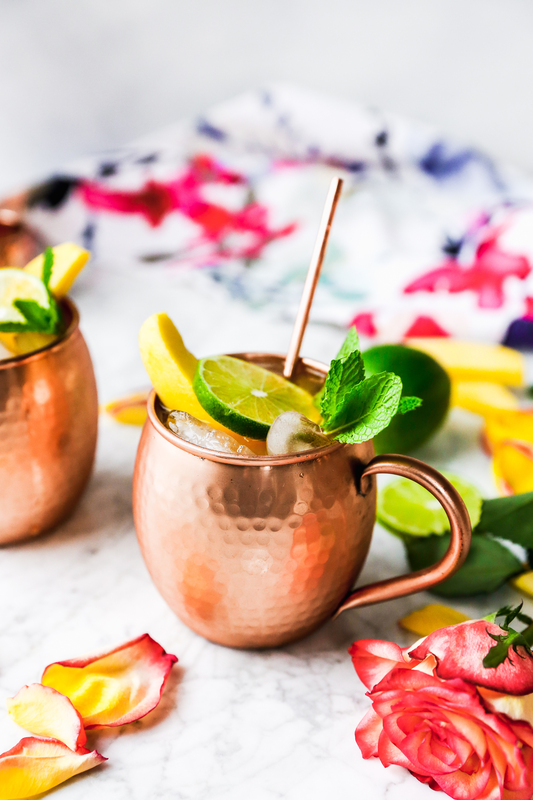 Top each glass off with ½ cup of the ginger beer. 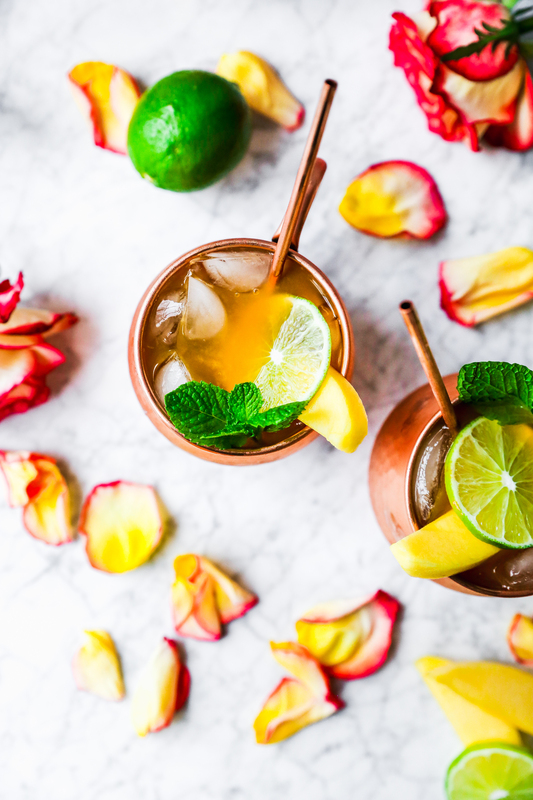 Garnish with additional mint, lime wedges, and/or mango slices. Serve immediately.